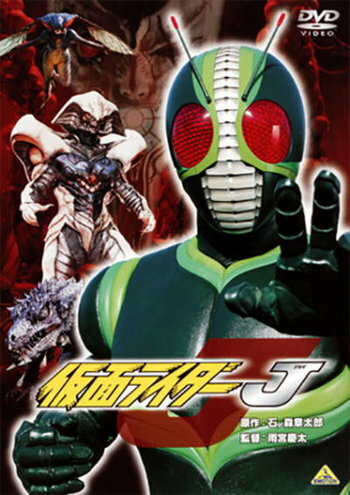 Kamen Rider J was a 1994 movie installment in the long-running Kamen Rider series. Kouji Segawa is a reporter whose little friend, Kana, is carried off by the monstrous children of the alien Fog Mother to feed to her newly-hatched offspring. Kouji is given the mystical "J Power" to become Kamen Rider J and defeat Fog Mother before she can destroy mankind. Footage from the movie was used in several episodes of Saban's Masked Rider, with J appearing only in faraway shots to hide how little he looked like Kamen Rider BLACK RX. J would appear in several later Kamen Rider movies, with the cameos being more minor as the years go on. Badass Biker: Kamen Rider, duh! Crossover: With Kamen Rider ZO in the 8-minute short Kamen Rider World. Guest-starring monsters from several Kamen Rider installments and Shadow Moon. Eldritch Abomination: The Fog Mother is a giantic cybernetic doomsday monster whose sole purpose for existing is to feed civilizations to her monster offspring. And that's even mentioning her true form. Flanderization: In later appearances J's ability to grow is the only thing about him that factors in at all. Good Hurts Evil: The Fog Mother feels intense pain when J is first given his powers. Green Aesop: It appears here and there, though the Fog Mother's plan doesn't revolve around it. Make My Monster Grow / Super Mode: A heroic example where J does this to himself to defeat the giant Fog Mother. Mama Bear: Fog Mother is actually quite ticked off when J kills her babies and tries to take him down with her as she's dying because of it. Nature Spirit: A group of weird plant people who bring Kouji back to life as Kamen Rider J and task him with destroying the Fog Mother and her evil spawn, they state they're spirits of the Earth. Shout-Out: Kamen Rider J's name is a reference to the Japanese Pro Soccer League, better known as "J-League", which was founded a couple of years before the movie premiered. Square-Cube Law: When J assumes his Jumbo Formation, not only does he move much slower than before, but the ground actually does collapse under his weight. Taking You with Me: After being mortally wounded by J, Fog Mother tries to take J with her. Technicolor Death: Oddly averted for the first three monsters, who simply die...but more than made up for with Fog Mother who goes out in multiple giant explosions. Terrible Trio: Agito, Zuu and Garai. Touch of the Monster: Kana passes out the instant she's carried off by Zuu, and spends nearly the entire film unconscious. The Worf Effect: Later appearances of J have him in giant form all the time - only to lose to something even more powerful. In Kamen Rider Taisen he's downed in the Cold Open!